Since Priyanka Chopra is married to Nick Jonas, her desi as well global fans are hooked to her daily post-wedding shenanigans. The Bollywood beauty updates her fans with every important event happening in her newly-married life. In her latest update, she posted pictures from her work-vacation to Miami with family members Nick Jonas, Joe Jonas, Sophie Turner, Kevin Jonas, Danielle Jonas. She posted sultry summer pictures on Instagram which went viral in no time. However, the notorious meme-makers soon made a spoof video where in they are seen dancing on Hum Saath Saath Hai song "ABCDEFGHI." Result= beyond hilarious! 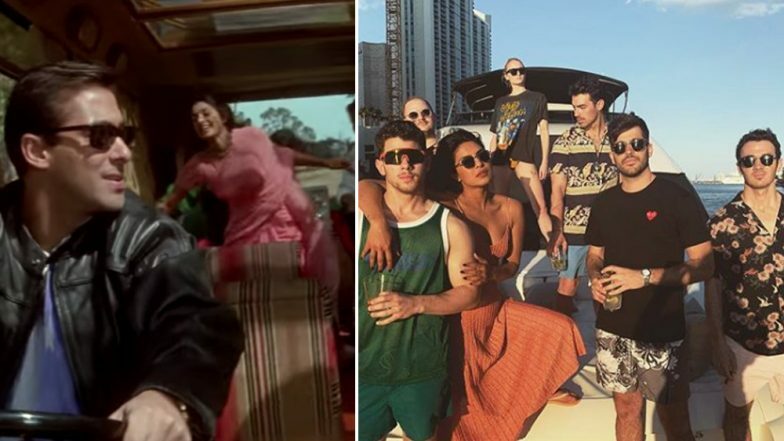 These Pictures of Priyanka Chopra Jonas and Nick Jonas Holidaying in Miami Will Make You Instantly Jealous. All the 90s kids have different memories with this fun(ny) song from the Sooraj Barjatiya film. Starring Salman Khan, Saif Ali Khan, Mohnish Bahl, Sonali Bendre, Karisma Kapoor, Tabu in the lead, this track was a rage in that era. The song has these family members going to Rampur for a mutual honeymoon trip! Well, the Instagrammers got a sense of déjà vu on seeing the Jonas family members dancing on their newly released "Sucker" video and here came the spoof video! It would be better if you watch the song yourself to see the resemblance! Watch Jonas Family's Miami Trip Ft. Hum Saath Saath Hai Video Here! If you are not an avid social media user, let us inform you that this is not the first time that the netizens have hilariously messed up with Jonas brothers. The new poster of "Sucker" where in all 3 couples are featured gave the Hum Saath Saath Hai vibes for the first time. Then on, the comparison got wilder and funnier and this video is another proof of it! How did you find the new spoof video?